involve working individually and with your colleagues. Angus Fletcher is an NLP Master Practitioner and is certified to coach individuals, teams and relationships. He has over 15 years experience of the non-profit sector in roles ranging from IT Director, Project Management and Fundraising Director. He has coached teams in the non-profit sector, schools, prisons and corporate settings. Angus is also the founder of Streetcoaching, a company specialising in coaching people on the go in the city. He is pictured in the Media Parents Christmas Party photos. Please find yourself on the Christmas Party photos below and comment to identify yourself! Thanks to all those who came and made it a great party! 2. Media Parents Director Amy Walker, centre and Jo Tracy, right. 3. Emily Freshwater, Will Bulman, Kylie McCarroll (lovely nails), Amy Walker, lady in pink, Jo Tracy. 4. Robin O'Sullivan and Elliott Cranmer, left, Rebecca Dowell and Michelle Dalton, right. 5. Sarah and Zain Sabur. 6. Amber Rose, the first Media Parents baby to be born, and Zoe Fryer. 7. Rear : Anna Brabbins, Clare Richards and Tim Allan. Front left, Media Parents Director Amy Walker, Julann Smyth, Emily Freshwater. 8. Jill Robertson tries to get away from Elliott Cranmer, right. 9. From left Mikhael Junod, Caroline Bourne, Rosie Bowen-Jones, Sarah Andrew. Foreground Benjamin and his mum. 10. Media Parents first baby-off. From left Linsey Winton and Raphy, Zoe Fryer and Amber Rose, Samantha Williams and Nyome. 22. Jude Parker, Alex Evans, Eoin O'Shea. 23. Background Anna Bonnadio, Corinne Sweet and Teresa Nunn. 24. Teresa Nunn and Lubna Bhatti with some enormous glasses of white. 29. Alison Matthews talks to Nina Ferguson, foreground. 30. Mikhael Junod, Angus Fletcher and Kat Hencken. 31. Erica Wolfe-Murray, Shurwin Harwood, Jean Manthorpe. 33. Amy Walker and Raphy talk to Jean Manthorpe and Carl Callum. 34. Linsey Winton, Lyn Burgess, Amy Walker and Raphy Winton. 35. Corinne Sweet and Iain Mitchell. 36. Nyome Williams and Donald. 39. Anna Brabbins, Claire Grossmith and her dad. 40. Donald, Ronald and little cracker Nyome Williams. Many thanks to all those who came along and made it a great event, and to ENVY for their kind hosting. Happy Christmas from Media Parents. 17. Media Parents Director Amy Walker, shamelessly minesweeping. Julann Smyth was a graceful victim. 19. Hello! Clare Richards, Tim Allan (as Curtis Brown), Anna Brabbins. 11. Jean Manthorpe and Erica Wolfe-Murray, right. 12. Angus Fletcher, foreground, Farrah Jaufuraully, centre, Corinne Sweet, rear right of frame. 13. Jane Lush and Kate Gibbard with Alison Martin. 15. This lady was not buying any of Jake Sumner's chat. 16. George Hencken foreground, with Alex Evans, Eoin O'Shea, Jude Parker and Hazel Palmer's hair. http://www.mediaparents.co.uk is running a series of Christmas Parties and networking events in early 2011 to help you make connections, so here are some pointers on effective networking. One of the hardest things to do as a freelancer is keep up your contacts, harder still is finding new ones. And it’s a million times harder to find the confidence if you’ve been out of the game having babies. Media Parents is here to help with that. Doesn’t matter how long it’s been though, taking off the baby head and putting on the work head again can feel a bit uncomfortable, and almost like it doesn’t quite fit the same either. Or, if you’ve been out of work for longer than planned (or wanted!) your confidence can take a large knock too. I went along to a networking event on behalf of Media Parents set up by ‘Third Door’ in Putney. It’s run by parents Shazia Mirzia and Yusuf who were looking for a better way to balance work and childcare. Their idea brought the two together. A nursery downstairs, and rentable office space upstairs for parents who want to work flexibly. They also put together events to help people returning to work, those who are starting a new venture or just giving people the chance to meet new people – networking. The event was not only ‘traditional’ networking (working the room whilst balancing a glass of wine and vol au vent in your hand), the evening started with a talk about the techniques and methods for making networking work for you. Anna Smee, a Business Consultant from Ovens & Smee, spoke to the group about ‘How to Network Effectively’. 1. What/Who is your focus? To get a job, to broaden your contact base, to re-establish yourself and get yourself out and about again. 2. Who should you speak to? Think broadly to find people who can give you opinions, not just people who can hire you, but people who can give you background on a company/programme or information about the industry at the moment. 3. What is your objective at a networking event? Just to meet people and get out there, or make concrete connections? 4. Compare yourself against others, can you be different, how can you highlight your talents and stand out? 5. Timeline the three areas: planning, execution and management. The most important thing is to prepare before you go – look at the list of attendees, do your research, find out about them and what programmes genres you have in common (if you’re coming to one of the Media Parents Christmas parties the names of some of the attendees are on the Media Parents watercooler – for a reason. It’s good to know who’s who. You can Google images of other people to give yourself a headstart. Sharing information can lead to all kinds of leads, direct and indirect. The purpose of an event is about exchanging details and finding mutual contacts. But it shouldn’t be all about me, me, me! It’s about building bridges, making connections and sharing information about programmes and people. So, as much as you would like advice and help yourself, you should also be helping others with what you can offer. Maybe you’ve heard that a company is looking for researchers (you’re a producer, so not for you) pass on the info, it might be a stepping stone for someone else. Don’t forget, you are interesting and other people will value your opinions. Something we don’t often consider is that other people feel nervous too, even Execs can be worried about meeting new people. The worst bit of networking is if the person you’re speaking to seems distracted or disinterested. DON’T take it personally. Everyone has a lot of things on their mind all the time, it almost certainly isn’t you that is making them behave that way, but instead the fact that maybe their child is ill and they want to go home, or they’ve got a big presentation in the morning and want to get off and finish it. If you can see it’s happening, be resilient and professional, say your thank yous and move on. What if you want to leave the conversation? Sometimes the talk can tend to wander and neither knows how to end it and move on. Honesty is the best policy. After you’ve exchanged details and talked about mutual interests, say, ‘It’s been lovely to meet you and I think I should go and try and meet a few other people tonight too’. 1. Always send thank yous to the organisers. Be courteous, and you’ll be invited again and remembered too. 2. With the new contacts you made; wait a few days before contacting; phone calls are better than emails. Always prepare what you’re going to say, have a little script ready. Stick with it and keep trying, perseverance will out! It’s very important to keep track of business contacts and any relevant and mutual information. Then if you meet them again, you’ll remember you both are interested in; rugby, running or maybe you’ve worked on the same shows, and will appear (and actually be) super organised with a fantastic memory! Ask friends and family for help. Just chatting about opportunities, what you’re looking for in the future, they might just have something that can help. With your friends in the business, don’t expect or ask them for a job, but ask them to look out for you, maybe the name of the HR person at the company they’re at. But don’t put pressure on them to deliver. Those relationships are for the long term and should be nurtured. Not all networking is about going to events where you’re expected to work the room. Think about the people in your life and those relationships that may be able to help you. There are three types of relationships, to consider. 1. Offers support – these people don’t work in the same business as you, but you can be honest with them, and they are with you. They may not help you find a job but they will help you stay motivated. 2. Refers/ Recommends – These people will usually work in the same business as you, and will email on your behalf to their contacts, forward your emails and put you in touch with others. 3. Consider you a candidate – These people want to employ you, but maybe haven’t got the right job for you at the moment. Make sure you keep in touch and let them know what you’re doing, every couple of months. I’m predominantly a studio producer, having spent fifteen years doing live programming including many many ‘This Mornings’! After having children I branched out in Edit Producing (BBC Ent), and P/Ding, including running VT departments, as well as development. I’ve also SP’d youth discussion and magazine shows, as well as compilations shows. I chose to take on a variety of short term contracts to maintain a reasonable work/family life balance. I’m looking to progress my career again now they’re both at school (and super keen to go to Disney World). Media Parents flexible working meeting : Bristol – who said what (1). “I hope we will be able to discuss the viability of flexible working from both a business and creative standpoint this evening, that we go away better informed and inspired to make positive changes. http://www.mediaparents.co.uk/ is all about flexible work that suits you – as a freelancer or as an employer. Mediaparents.co.uk is a new jobs and social networking website which collects short-term contracts, part-time, job share and regular hours media jobs in one place so experienced talent can find them. Chris is the new head of talent at the NHU and BBC factual. He’s been in the new post since September and was Series Producing before that. He claims that most of his team does or has worked flexibly, and that he’s always encouraged this. It makes people happier. “Parents are better time managers and so very desirable employees.” Chris admits that this is easier to achieve on some projects more than others, especially within the NHU it’s possible though – it can be a good use of budget to have part time workers. Chris’s own mother was an actress, so he’s familiar with the problems she had juggling care of him and his brother. Chris is trying to convince other BBC departments that flexible working can work for the employer. If anyone feels the BBC isn’t getting it right, let him know. COMING NEXT : Annie Warburton from Skillset and the Bristol Anchor Partnership speaks. With thanks to Chris Hutchins and BBC Bristol for hosting, to Harriet Wallace, Kate Edwards, and Rachael Power for taking notes, and to Amy Organ for taking photos. On November 17th Media Parents Series Producer Alison Martin organised a debate for the RTS in Southampton called “TV – No Career for a Woman?” Here’s Alison’s summary of who was there and what was said. http://www.mediaparents.co.uk is working to provide solutions to many of the issues raised below so do join us! Says she sometimes wishes she had “a real profession…I always wanted to be a doctor”! “TV’s not the only job there is”! More flexible working (but NOT full-time work for part-time pay) http://www.mediaparents.co.uk/ is a great place to find flexible working options – or any jobs – we let the talent choose if the work is right. More job-sharing http://www.mediaparents.co.uk enables you to find other freelancers with a similar skillsbase, and indicate to employers who your chosen jobshare partners would be. See elsewhere on the Media Parents site and http://blog.mediaparents.co.uk for information about companies who support flexible working in media, and how to approach them. Media Parents Christmas Parties – all welcome! http://www.mediaparents.co.uk/ is a new jobsite for people who want to work flexibly in media. 5,000 women and 750 men have left TV in the last 3 years (Skillset figures), and the other creative industries are following this pattern. Media Parents wants to help change this trend and keep hold of talent by creating a platform for employers to find experienced workers. To find out more, why not join us at one of the Media Parents Christmas Parties – they’re not just for Media Parents members so do bring friends and introduce them. There will be a healthy mix of companies, freelancers and broadcasters! Annabel Laister and Gilly Smith are organising this and all are welcome. It’s a paying bar but mince pies at least are on me! 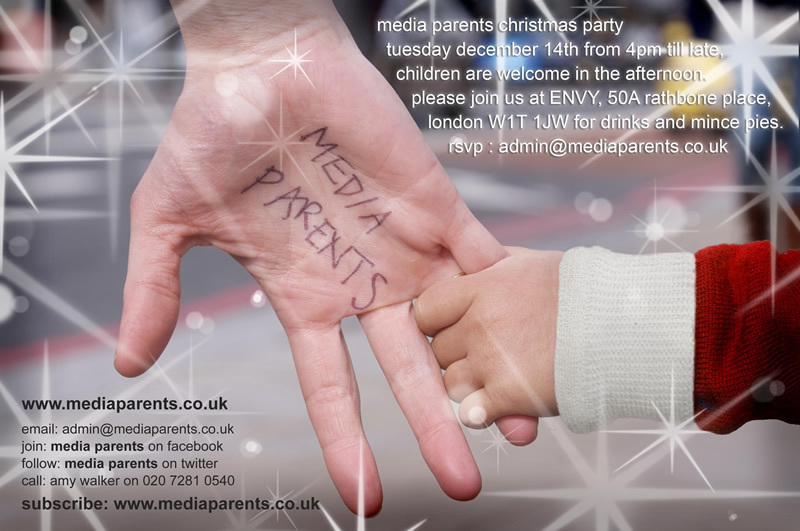 admin@mediaparents.co.uk You can also RSVP by clicking the contact button on the Media Parents site.